The first step to a dreamlike vacation with your family or friends is the choice of paradise setting; Mauritius, Morocco, Sri Lanka, Bali and Thailand are just a selection of our wide range of luxury villa destinations. Once this is decided, it’s onto the pursuit of the perfect villa, and what better than one that is fully staffed, with personalised services to suit the needs of your entire party? Here are 6 of our most beautiful villas with services that allow you to indulge in carefree luxury. 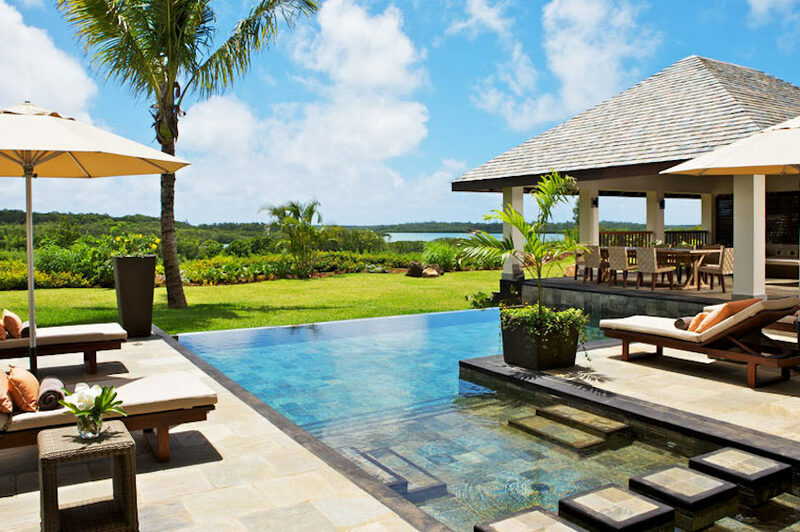 In the East of the island, Anahita Villa is an airy seaside Mauritian haven with dining spaces that open out completely to the pool terrace, with lush lawns and palm trees beyond. This open-air atmosphere is continued throughout the property, where each of the bedrooms feature floor to ceiling sliding glass doors, allowing you to feel like you’re amongst the lush greenery. Its two infinity pools overlook the stunning Indian Ocean, and it even has its own 18-hole golf course. The resort in which it is located also has a bustling “village” right on the water’s edge, with a personal fitness centre, boutiques, tennis courts and a well-being lounge. The luxuries don’t end there, as the villa includes a private villa host (butler) service, a private chef with the option both of in-villa and in-room dining, laundry and daily house cleaning, an attentive concierge service and a babysitting service to allow adults to enjoy some time alone. There is also a kids club (8 months to 13 years) and teens club, to ensure the entertainment and contentment of the entire family. At an additional cost, the villa even provides helicopter, private car and boat transfers! You truly will arrive in style. 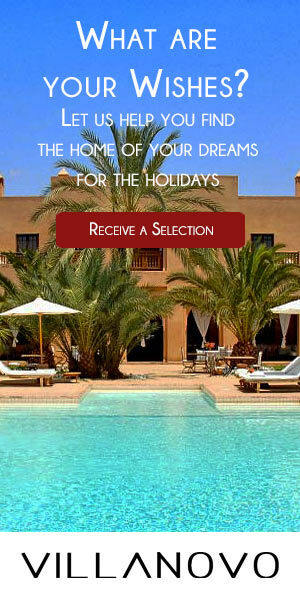 It’s the ideal property for up to 10 persons to be spoilt for the holidays. Still in Mauritius but now in the Southwest, Villa Cassiopée 31 is a vision of stone pool terraces with palms reflected in the water, surrounded by quaint pyramid-shaped tiled roofs. With 6 bedrooms and 6 bathrooms, it is the ideal getaway location for up to 11 persons. The villa is divided into two wings; the first with the living and dining room and kitchen as one space designed for social pleasures, and the second devoted to the intimacy of the bedrooms with lovely interlinking gardens, patios and water features providing an atmosphere of calm. Upon arrival, you will receive a welcome pack before being introduced to your private haven. The fully-staffed villa provides daily cleaning of the rooms, where Linda, the housemaid, works from 8am-3pm Monday to Saturday and 8am-12pm on Sundays. Although her main duty is to ensure the presentation of the house is kept at a high standard, she is also able to assist with preparing breakfast, lunch and dinner (the latter two being charged at 25 € a meal, excluding the cost of groceries). There is 24/7 security at the villa, to ensure your safety and peace of mind at all times. For transportation around the site, a golf cart is also included, with golf courses very close by as well as fantastic beaches! 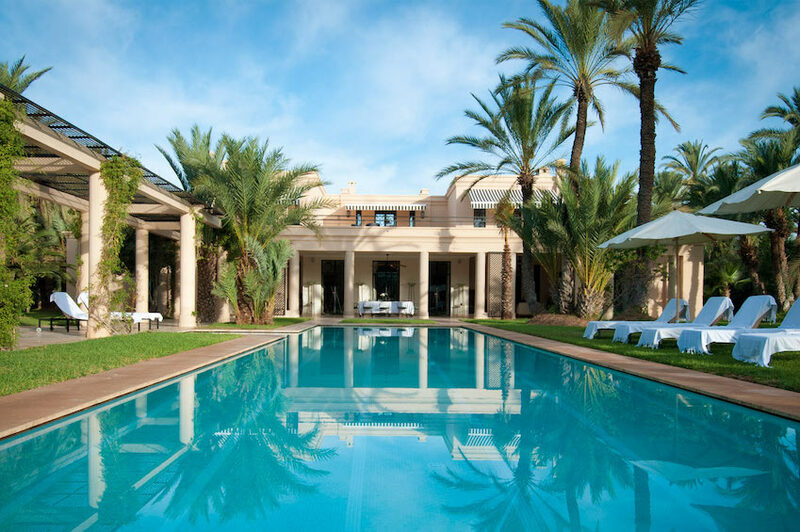 Morocco is no stranger to incredible villas with an extremely high standard of personalised services run by dedicated housestaff, and Villa Laya in the heart of the Palmeraie of Marrakech is no exception. The gardens of the villa are sensational, with a gigantic pool fringed by lawns with loungers and parasols, vine-covered terraces and palm trees creating an atmosphere of the exotic. The interiors are lavish creations of marble floors, pillars and fireplaces, fully-equipped modern kitchens and luxurious hammams. Within this palatial setting, you and up to 9 others can enjoy the attentive services of the fully-staffed villa, where a cooking service of delicious traditional meals is included, all made to your specific tastes and preferences. Hammam treatments are available at an additional fee, as well as the arrangement of airport transfers. Villa Akila has not only a poolside, but a lakeside too, with a beautiful grassy area between both bodies of water to while away the days in utter tranquility. However, what makes the lakeside location truly magical is the wooden jetty that forms one of the most picturesque settings you will ever dine in, seemingly floating within the vast tropical landscape. There are multiple outdoor spaces all curated for maximum relaxation, from rocking chairs on covered terraces to outdoor cushioned beds within the greenery. The interiors are stunningly open, where the master bedroom is a colossal light space in which almost the entire wall can open out onto the surrounding veranda, and the beds in each room have dreamy white-netted curtains floating around their four posters. The fully-staffed villa offers housekeeping and garden maintenance as well as a chef to prepare all of your meals (excluding the cost of the groceries), so you can wholly devote your time to your loved ones. You can also choose to make use of the chauffeur-driven car to explore the wonders of the island, also at an additional cost. 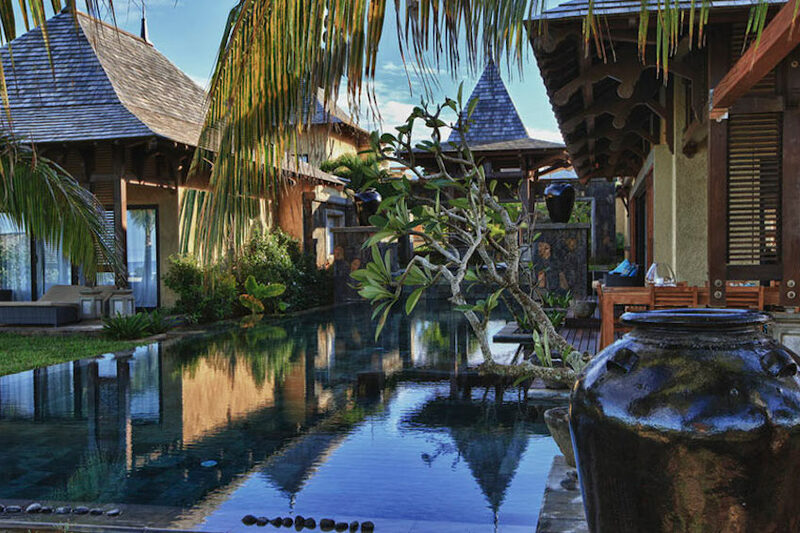 Bali is also renowned for its selection of stunning villas with dedicated services, all with the aim to ensure that your stay is one of well-being and tranquility. 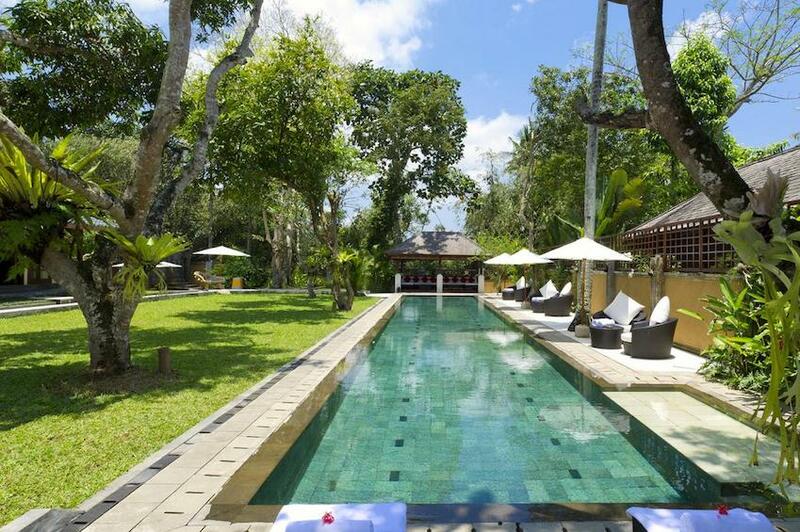 Villa San offers a private haven for up to 14 persons, just minutes from incredible spas, shops, picturesque layered rice fields and cultural performances of Ubud. It has a large pool bordered by cushioned chairs, loungers and leafy plants, with a stretch of lawn dotted with larger trees, and a lovely wooden gazebo providing sheltered lounging. The interiors are stunningly decked all in wood, from floors to window frames and counters to ceilings. As soon as you arrive you will be greeted with a welcome drink and complementary fruit basket, and the bathrooms will contain a selection of bath products for your use. Housekeeping is all taken care of, along with pool and garden maintenance and a high quality concierge service. You won’t have to worry about what you prepare in the mornings as breakfast is all included, and your private chef can also make you a sensational lunch and dinner (cost of groceries not included). Your comfort and peace of mind is assured with the Villa Manager and security service there to attend to your every need. For even greater luxury, massages, spa treatments and a child care service are offered at an additional fee, as well as a car and chauffeur. 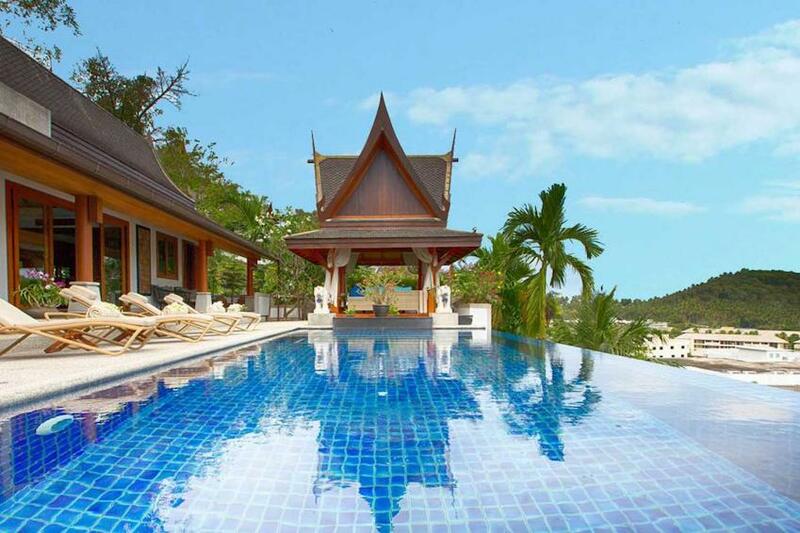 When staying in the island paradises of Thailand, a villa should match the standards of the natural beauty and magical atmosphere of the place. 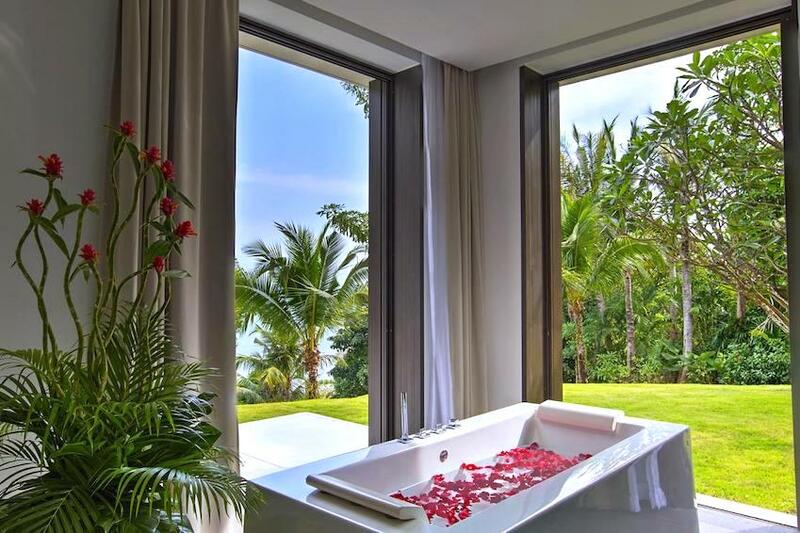 At Villa Baan Surin Sawan it does just that, with patios for dining and barbecues surrounded by lush gardens, infinity pools with breathtaking views, baths that mimic natural pools with gentle waterfalls filling them, and rooms that open up to the tropical outdoors. Alongside this, up to 8 persons can enjoy the attentive service of the Villa Manager, daily house cleaning ensuring that the villa looks as good as the first day every day, a security service, and a refreshing breakfast included each morning. The chef is also available to cook all other meals (with the additional cost of groceries), and airport transfers, car rentals, babysitting services and organised excursions can also be arranged at an additional fee.